On a grassy knoll, with trees, outside a castle, the King’s soldiers arrest the Duke of Gloucester on his horse. You can tell the King on the right by his crown and the royal coat of arms just visible on his horse’s caparison; the duke of Gloucester is identified by his robe, which is drawn using the heraldic convention for ermine. A boat is parked nearby, perhaps to carry the Duke off to Calais, which is hinted at in the background. After the decease of Queen Anne, Richard II., then in his twenty-ninth year, made a contract to marry Isabella, daughter of Charles VI., king of France. The affianced bride was only seven years of age, but Richard was desirous of securing a treaty of peace with France, and of thwarting his uncle, the duke of Gloucester, who had never reconciled himself to the loss of power. On November 1, 1896, the marriage was celebrated with much pomp by the archbishop of Canterbury in the church of St Nicholas, at Calais, and the child-queen was crowned at Westminster with great magnificence in the following January. Richard the Second had a weakness for expensive pageants, and the dowry received with Isabella was speedily exhausted. His necessities caused hiin to devise a method, (which was copied by many of his successors on the throne, down to the time of Charles I.,) whereby the royal exchequer might be replenished at a cheap and easy rate, viz., to demand loans, or rather gifts, under the name of “benevolences,” from his richer subjects, who knew not how to refuse, without forfeiting the royal favour and exposing themselves to loss and extortion in other ways. This became a sore point with many, and the duke of Gloucester took advantage of it to foment ill-feeling against the king. Comparisons were drawn, to his prejudice, between the existing state of affairs and that under his renowned grandfather. The old and hateful spirit of jealousy of the French was industriously excited. The feebleness of the government was ridiculed. Gloucester’s partisans diligently set him forth as a patriot, and the duke himself was perpetually dropping contemptuous expressions in the hearing of his royal nephew, which must have annoyed and irritated him beyond endurance. 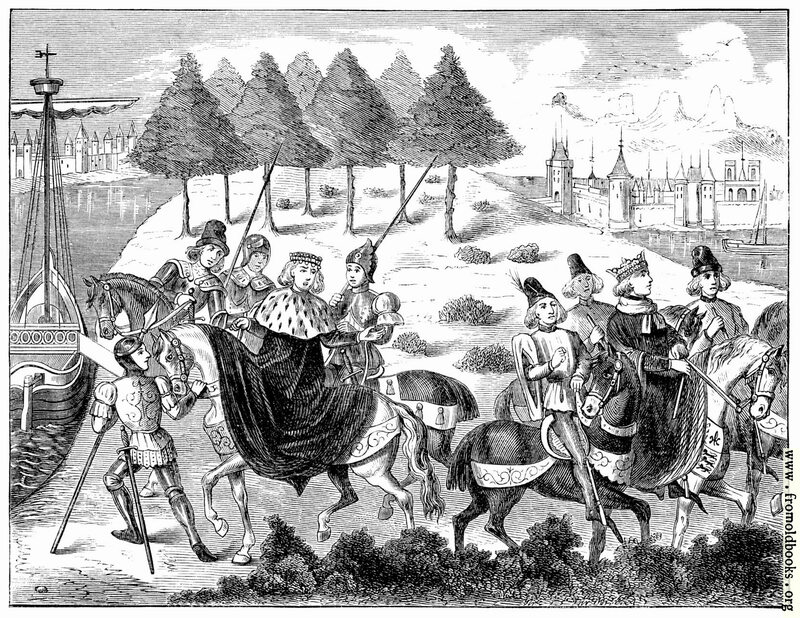 Froissart alleges that the duke had proposed to Roger Mortimerm earl of March, (whom Richard had designated his successor, as the nearest in blood,) that he should at once assume the kingly dignity and depose Richard; and that meeting with a refusal, Gloucester then designed to divide the kingdom between himself, his two brothers, and the earl of Arundel. Whether this was so or not, Richard determined on striking a secret but speedy blow. The earls of Warwick and of Arundel were arrested, and the king himself proceeded with a guard to the castle of Plashy, in Essex, and secured the duke of Gloucester, who was secretly dispatched in safe custody to Calais. So promptly was this done that not even his most intimate friends knew of it, and for several days the opinion prevailed that he had been murdered. To quiet the public mind, a royal proclamation was issued, which stated that the arrest had been made with the consent of the dukes of Lancaster and York, and with the consent of the earl of Derby (Henry Bolingbroke) and other peers; and that it was made, not for the proceedings of 1380—1387, as was supposed by some, but for recent offences; and that none of the king’s subjects had cause for apprehension as to the part taken by them during those years. The next step was to secure a condemnation in legal form of the three arrested noblemen, for which purpose a Parliament was appointed to be held on the 17th of September 1397. To these charges the earl of Arundel pleaded, first, not guilty, and offered to prove his innocence by wager of battle. This being denied, he next pleaded the royal pardon, but this plea was set aside, as the pardon had just been revoked. He was then condemned, and forthwith led back to the Tower and beheaded. The earl of Warwick was also condemned, but his sentence was commuted into imprisonment in the Isle of Man. Orders were given to bring up the duke of Gloucester, but the earl marshal replied that he had just died of apoplexy in prison at Calais. 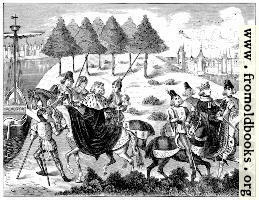 However the duke was declared to have been a traitor, and all his property was forfeited to the crown.